I operate only CW. Please don't send cards claiming SSB or data mode QSOs. Please, DO NOT send to the F, TK, W4 or G bureaux you will not receive a reply. IRCs: Please unless you cannot avoid it, don't send IRCs. Please include US$2 to help defray expenses. If your card is two sided, make sure your call is on BOTH sides, clearly. Flipping the card can sometimes cause mistakes. Make sure your band is in frequency (MHz) and not in wavelength (metres)! Do not place religious quotes, symbols, pictures or pictures of religious places on your card. They will not be answered. If you don't do this, it is easy for QSL managers to make mistakes. If your logging software outputs metres without an option for MHz, request that your software writer includes this in their next release. QSLs - Why no IRCs? Discussion amongst many DXers in NA/SA have shown that the USPS is making it VERY hard to encash IRCs since 2007-01-02. In fact, although they are supposed to sell them, they have no idea what they are. 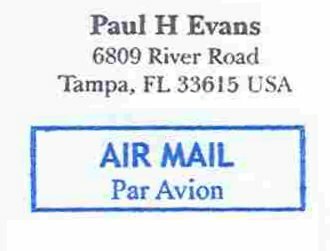 If you send a self addressed envelope it makes returning a QSL to you VERY easy and VERY much less prone to errors. There's absolutely no need to put the senders address on the top left of the envelope. If you put your own it will freak out the USPS (since 2001-09-11 they delay or destroy many sent this way). I have my own stampers and if you put your address there, I will just have to black it out anyway. It makes life much easier if you include a self-adhesive envelope. It saves those tongue paper cuts which are truly awful. Buy a supply of them, other DX stations will like you for it. The rate for sending a letter from the USA to outside the USA increased from US$0.66 to US$0.98 after 2007-01-01 (and to even Canada to US$0.75). A HUGE increase. The cost (at the lowest price possible) of a full colour QSL card is US$0.08. If you send US$2 and SAE it helps a lot!!!! Sending one from VP9 costs well in excess of US$2. A very complex calculator for USA mailing can be found here. I'm not a member of a Society which receives & sends bureau cards. "QSLs" - Why no eQSL ot LoTW? I signed on to eQSL, but there were too many people trying to falsely claim QSOs, so I gave up. LoTW registration from outside the USA seemed impossible to achieve. I tried. I gave up in frustration. Besides, these aren't really "QSLs", so I changed my philosophy and abandoned these electronic means. QSLs - Why none sent out from me? I gave up DX chasing at least 20 years ago. If you want a card, you'll get one, but I don't send any out unless I receive one first. Thank you. Please check the FAQ. QSL cards are (not) printed and being shipped direct. They do not look exactly like the image shown above. To International: US$1.05 <------ breaks through $1 for first time! © 2011-2019 TK/G4BKI. All rights reserved.